You can find Miriam here and here on Ravelry. I find inspiration EVERYWHERE! Sometimes it's a print on a piece of fabric, sometimes a photograph, sometimes a whole period of modern design... it really varies. Lately I've been thinking a lot about historical fashion and the details that went into clothing in the 16th and 17th centuries. 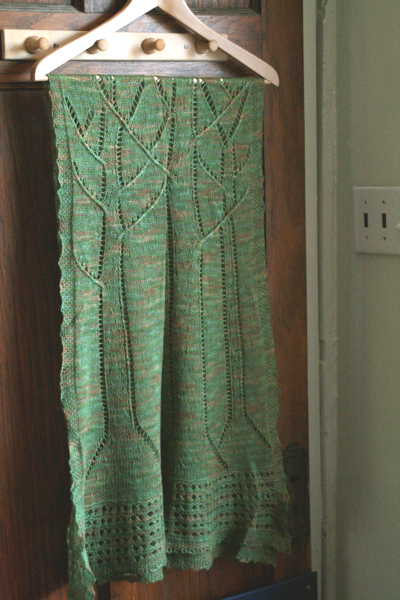 I haven't figured out yet how I want to translate that to knitting, but it's percolating. I recently released the Silver Screen Collection of glove patterns inspired by 1940's actresses and the glamor of Old Hollywood. I think saying it's a controversy is a bit alarmist. I think there is a camp of knitters who want everything spelled out, they want to not have to think when they work up a pattern because they knit for relaxation. I think that's valid, but I also think that the camp of knitters who want to be challenged by a pattern and want to learn something every time they start a project also have a valid way of doing things. Most of the time I'm in the second camp. I like to be challenged, but there are certainly times when I want to be able to trust that the pattern I knit is going to come out perfectly if I just blindly follow the instructions. There's room for everyone at the table, but having said that, I think it's ridiculous for a knitter to expect to make a fitted sweater fit THEIR body without any modifications, or to expect every sweater to look good on a particular body type. Most of the time I knit the samples myself. If I have a different size or a re-knit of a finished pattern in a new yarn, then I sometimes farm it out to a sample knitter, but there are details that I work out as I knit that wouldn't be the same if I didn't knit the pattern myself first, so that's usually what I do. I did. I graduated from University with a degree in Business, so I have put that training to good use. I actually am launching a new way of doing my business in January. I'm going to be offering 2 collections a year and run them a bit more like a fashion design business than the traditional knitting design business. Each collection will have a color theme and a technique or motif that runs through all the pieces. I'm very excited about this model and it's proving a great source of inspiration and focus. I'm working on collecting images, color samples, and snippets of yarns I want to use for the new story and I'll be documenting the motifs and swatches as I go. I think that it will be great for knitters to catch the enthusiasm of the collection as it unfolds. I'm planning on developing new classes to correspond with each collection as well, to tie in the teaching aspect. I'm also going to start offering sweaters in these collections, which is relatively new for me, since my designs have been primarily accessory patterns. Not really, but I have a great support network of other indie designers and friends that I go to when I need a little help or a sounding board for an idea that's stuck in my head. I try to take it with a grain of salt. Most of the time I'm very hard on myself, so I instinctively take criticism a little too personally, but I try to get over it pretty quickly. Being upset about it is just a waste of my creative energy. But if it's a valid point, I put the critical thought in the mix and see if I can do anything about it in future. Sometimes criticism is just about personal style and the debate can get very polarized. 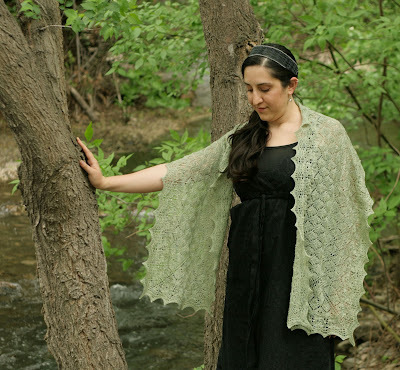 For instance, when the Ancient Woodland Shawl (picture is attached) was shipped out in a kit mailing for Year of Lace, there were 2 VERY different reactions. Some people loved it and voiced their support, while others actually said they hated it enough to shred the pattern. That was hard to deal with, but it just boiled down to it not being everyone's cup of tea. I had been offering patterns for sale for about 6 or 7 years before I was making enough every month to pay the major bills. But even now, I wouldn't be doing this full time if it weren't for my spouse and his work's health insurance. Figure out your strengths, what you can offer, and get a clear vision of what you expect to get out of it. Then make it happen. If you're honest with yourself about what you want, what you think you can achieve and where you want to end up, then it's a pretty simple step by step of how to get there.